DAS/STAR Coding Any links or post’s leading to pirated software will be immediately deleted. SLKWORLD is not responsible for any damage caused by miscoding, use at your own risk. Hopefully a simple question. It's looking like I have to buy a DAS or Xentry system for when I do my conductor plate. I don't know much of anything about them. Some of the units I have seen for sale indicate they are set up for offline coding. Does this mean that they an be SCN coded without a Mercedes account? My immediate goal is this, SCN code the new conductor plate and then update all the firmware in the car to the latest. Everything after that is gravy. So when they say offline coding does it mean the software on the laptop has copies of all the latest firmware or am I way off-base? Yes, the procdure is to capture the coding of the old component and input it to the new component. Unfortunately, this member (@i860 ) is unavailable at present. He'll check in next week. Related thread that may interest. I'll order one of those anyway because it's better then my scantool (which is excellent) but I have lots of laptops so this is a no-brainer. I wonder if it will do the transmission adaption where you drive it and set the gear shifts? This alone would be awesome!! But he says in that thread that it will not do SCN coding. Understanding now that off-line programming means copy and replace from old module to new, would that include the SCN coding? The issue is installing new OE conductor plate that is not SCN coded. Offline coding is used to mean you can manually code things. "Automatic" SCN coding is only available online. This is different than programming which is loading firmware into a control unit. For your purposes just get the programming off the current unit before disassembly. So what you're saying is that it should work? Ie, copy coding from existing conductor plate and when I copy it to the new one it will take the SCN coding with it and apply it to the new one? Sorry for being dumb but will get up to speed in short order!! Oh then you are subject to several complications. If you have an early conductor plate you will also need to change the valve body. Also you will not be able to code it with an "offline" DAS setup. Best would be to have your current one "remanufactured". Hmm...so what you're saying is that offline coding does not also do the SCN coding ? Offline coding is not the same as SCN. At least you have VGS2 so you do not need to change the valve body. Right. And I'll be using an OE reman Mercedes conductor plate. So the issue is, SCN coding. If I cannot SCN code it myself I have to get it towed to the neighboring town....this is what I am trying to avoid. Which is why I was looking at the Xentry C5 clones. I'm guessing I would have to buy a one-time access account or something along those lines unless someone has a different idea? If your current is not salvageable then that could be an option but it is sometimes difficult to get setup for online. Where does one buy an "OE reman conductor plate"? From MB? Option #1 : have Mercedes generate a few bytes of data which must then be download into the TCU. The transaction is an online one. You'll have to climb a pretty steep learning curve, and probably an expensive one as well, to buy and then learn the capability to do this. Mercedes doesn't just give away that kind of access - since the whole idea of all this monkey-business is to eliminate chop-shops, it would defeat the purpose to allow just anybody to gain this capability. And I'm guessing MB doesn't have any sort of program to help individuals - they're more inclined to help dealerships who already have some trained (and likely bonded) personnel on-site. Option #2 : There are unofficial services that can transfer all the bytes (not just the few) from an old TCU to a new one, but you have to send them your old TCU. You may have to buy the new TCU from them as well. I've never used them, but if I was in your shoes this is where I would go. Option #3 : There are online companies that offer a subscription-based service geared to indy mechanics that want to perform these types of repairs. If you can find an indy near you that subscribes to something like that, it would likely be less expensive and irritating than option 1. The way this works is the indy calls the service when they're ready to perform the coding, and someone accesses the car remotely via the internet. 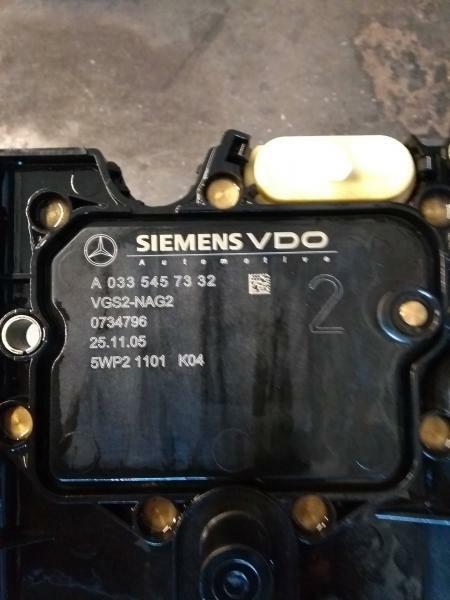 Yes, an OE plate is bought from Mercedes, they are all reman plates now with a core charge. There are no independent shops here that can do SCN coding. The only option locally is the Mercedes Dealer and that's not very local. As mentioned, I would have to have the car towed there and probably back for me to complete the work (filling the trans because apparently the car will not start with the new plate in it unless it's SCN coded. This is a huge pain the rear and costly. I want to avoid this at all costs. I'm looking at e-bay and there are several auctions that provide one-time service. This may be the way to go. One of the services I was looking at gets you one log-in. They say you can do anything (including updating all the firmware in the car) provided you do not log-out. So that could be the way to go. If so, that bring the issue, what tool do I need to do SCN and firmware coding? I have no problem with the one-time fee and it would save me from towing to dealer and back and other large hassles. But that means a tool that supports that. That is the difficult part, I'm not up to date enough to detail it for you but there are hardware limitations (some inferior clones are not able to do online) and software-licensing requirements (A particular "hacked" version of MB might not work). Best would be to get a unit from a seller that offers online coding or discussing the requirements with 3rd party sellers before buying hardware. Tried to order the conductor plate from my regular on-line seller in the US (getmercedesparts.com) and they nixed the order on the basis that it's a theft relevant part. So I scanned my insurance and a picture of the VIN and they replied back that they still can't sell it to me. So now it's looking like the only person that will sell it to me is the parts counter at my dealer. They don't care. But the thing is, the price is more then twice as much (about $1300 CAD). Vehicle: 1998 Yellow SLK 230 Kompressor, 2002 Polar White SLK 230 Kompressor. If you are talking about the transmission conductor plate in the 722.9, it's easier ad cheaper to send the old plate into one of the online electronic repair places and have them replace all the components and check the computer. only costs a few hundred and takes three or four days, week at the outside from when you send it till you get it back. then you don't have to marry a new computer to the car because it's the same computer. If you buy a new conductor plate you need ONLINE scn. Don't buy c5 go for c4 with full chip, PM me, i can setup up for online your system. I did online scn on my cars.